Curtis Alan Jones (born April 26, 1967, in Chicago, Illinois) is an American electronica and house music singer, songwriter and producer. His style of house music has been compared and inspired by the likes of Kraftwerk, Prince, Gary Numan, and Nitzer Ebb. 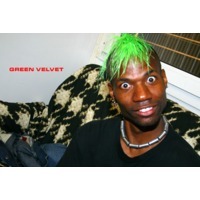 Jones is also known as Geo Vogt, Green Velvet, Half Pint, Curan Stone, and Gino Vittori.